Yesterday I shared with you one of my favorite sunset at marine drive pictures.. Today, I bring to you Lol moments from Mahabaleshwar.. I apologize for the slightly blurry pictures, the phone camera was terrible and I was laughing too much. This was the same day before the whole Mushroom Risotto thing happened.. So we left early in the morning after a fruit juice and/or coffee and hiked around the area for a greater part of the day.. come lunch time, we were hungrier than giants. 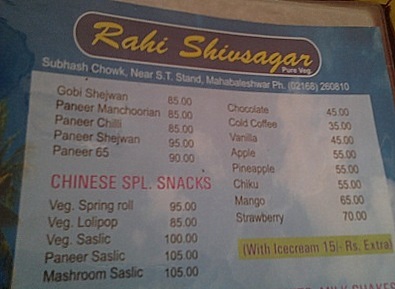 And there we found Rahi Shivsagar! It seemed like a decent enough place to get into so we all did. And here’s when the lady responsible for the Mushroom Risotto parted ways with us. Until we got the menus, we were only hungry, after the menus, we were also greatly entertained, severely judged and amused in epic proportions. I mean seriously, just look at the typos. 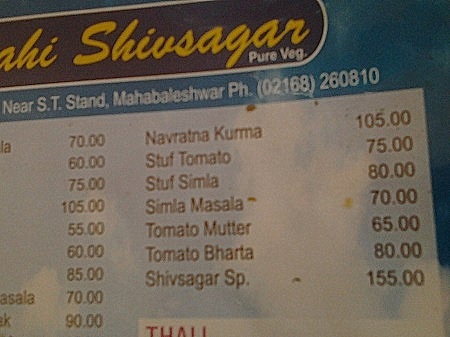 Because who doesn’t want to devour a Navratna Kurma, or Stuf Tomato! And if that wasn’t enough the cousins and I decided to do a quick imitate and recall of the “waiters” as they narrated the menu with practiced precision. Not that it stopped our antics in the slightest! And it is simply because of this laughter and the fact that I’m a slow eater, we stayed on for like two hours, laughing, eating, and being served last. The rest as they say is history..! Damn I’m hungry now.Gotta Go!